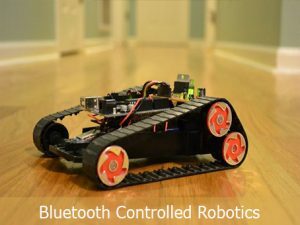 Bluetooth Control Robotics is a fully fledged embedded system to be controlled by Android mobile phone instead of any other medium such as buttons or gesture. Here we need an android phone with applications having touch buttons to control the car in forward, backward, left or right direction. Android phones are used here as a transmitting device and Bluetooth placed with robotic module will be the receiver. Our cell phone can send command using its in-built Bluetooth to a robot for its movements. This workshop will be addressed with hands-on session in developing interesting robotic car which can be controlled using our mobile phone with the help of Android Apps. A student will be able to come up with a machine which can be controlled by using in-built bluetooth of Android phones. Designing, Development and Controlling of a robot from mobile phone using Bluetooth technology. Develop an app to send command to a hardware device using in-built Bluetooth of Mobile phones.